It’s still summer. Don’t give up on your yard yet. Ah, what to do this weekend? You have to do something, right? It is still summer, after all. Well, for starters, rain or shine, Saturday is the annual plastic pot recycling day from 10 a.m.-5 p.m. at the Alaska Botanical Garden. This is a very special opportunity for gardeners in the Southcentral area to get rid of a lot of stuff that's not needed. You can recycle any plastic pot, tray or cell pack. And, this year, you don't need to sort them! So gather up the stuff. Please, do wash everything. And, no metal wire hanging apparatuses and the like. Be extra courteous to the volunteers by not leaving bags, boxes or any other trash. And, should you need pots or containers, you can pick up as many as you want. This only happens once a year. Take advantage of it to clean out your greenhouses, sheds and crawl spaces. Next up, just as all gardeners should recycle their excess plastic, every one of us should spend at least half an hour walking the property and the street adjacent to it, picking Linaria vulgaris, aka "butter-and-eggs" this week. This is a rain-or-shine event, too. These yellow and orange snapdragon-like flowers are in bloom and starting to go to seed. These plants are fast rivaling dandelions in numbers. You may not see them because they love alleys and secured spots, but they will spread into the open. Each plant produces thousands of seeds. Get them now. Do it. Do not delay. Do not argue. And, while we are at it, butter-and-eggs is one invasive we all have. You probably have at least one of your own on your property, a plant that acts as an invasive, at least for you. Remove the flowers. This is where the seeds come from, folks. This is a great weekend to clean up debris. The best tool for doing this is a good blower. I know they are noisy and the gas models pollute. An electric version should moderate things a bit. And you can co-ordinate with your neighbors to minimize disturbances. The place to start is the driveway. Do your gutters, carefully, and get porches and walks. You will be amazed how much better your property will look. In fact, if you have not cleaned up in a while, you should consider a bit of weed-eating before you pull out the blower. That way you can clean up the cut grass and weeds as well. Heck, mow the lawn, too, so you can clear those clippings off the driveway. And, if you want to put a finishing touch on things, how about trimming the lawn that's encroaching on your driveway and walks? There are special tools that you can run along the pavement and cut the overlapping turf and make quick work of things. You can also use a shovel or hoe. If you have never done this chore, I am guessing you will be both amazed at how much the lawn has grown over your drive as well as how good the place looks after you restore it to its original area and impart a "neat line" all along it. If you like "new" potatoes, these are nothing more than potatoes that are not fully mature. You can early harvest some of your own plants. Check by pushing your hand into the bottom level of a hill or into the bottom of any container in which you are growing yours. Pull out a few of the little guys and eat away. Don't take them all. They will continue to grow and they will get sweeter as the cooler weather moves in. Many gardeners start to limit the number of flowers on their tomatoes so that the plants will concentrate on developing the existing fruit. You can pick them off by hand. On plants that put out new flowers from the growing tip — indeterminate plants — simply pinch off the growing tip. If you grow cherries in Southcentral, you need to keep an eye on your crop. It may be ripe already, but if not, it surely will be in a week. Your goal is to harvest before the birds get them. You may want to try a scarecrow or put reflective tape in your trees to scare them off. You should be able to get one more session of lettuces growing in your garden or in containers on the deck. Plant them this weekend. While you are at it, why not harvest what you have before the slugs get it. When lettuces get old, they become bitter. Mushrooms are appearing. Some are edible. You might want to get a good Alaskan mushroom identification book or head over to the Alaska Botanical Garden site to sign up for one of their mushroom ID walks is going to take place. There are several scheduled, Aug. 23, 30 and Sept. 6. 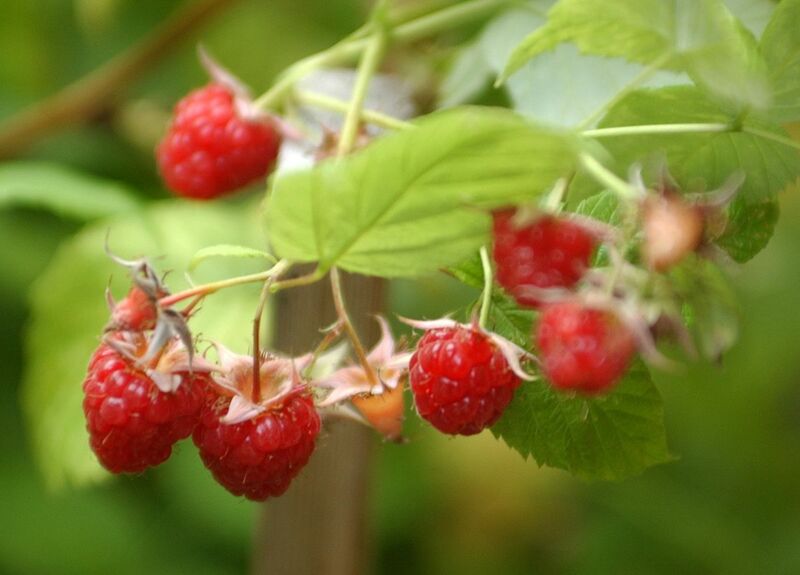 Finally, raspberries are ripe. So are many varieties of strawberries. Time to harvest folks. This is why we grow them! Big fat yellow caterpillar with a stripe on its back: This is actually a sawfly. It goes by the common name of "elm sawfly." Quite beautiful! We don't have elms. They live off birch and cottonwood leaves. Broccoli, cauliflower: Broccoli will continue to produce new heads if you harvest by cutting the head and leaving the base. Not so with cauliflower. It is a one-head crop. Harvest yours when ready.